A Special Exhibition for the Year of the Monkey was unveiled at the Temporary Exhibition Hall on the second floor of SSTM on January 15, 2016. We human beings were very close to apes, Darwin once said. About 7 million years ago, the ancestors of Africans were divided and formed in chimpanzees, gorillas and human beings. The biological and mental characteristics of human beings are consistent with other non-human primates, and the research on apes is an important way to explore the origins of human beings. 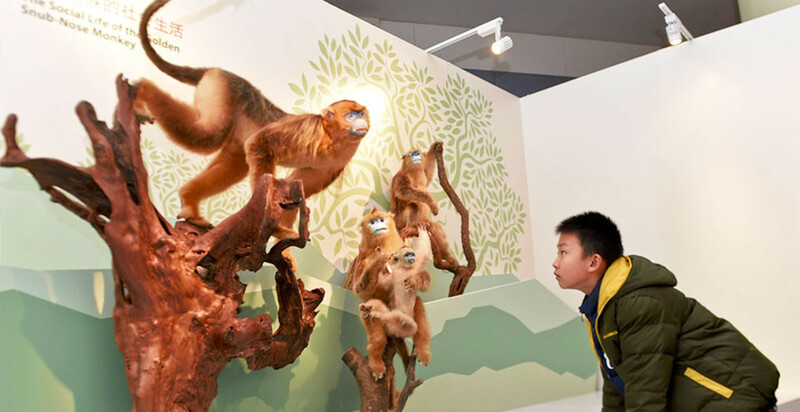 The exhibition focused on a serious subject to explore the origins of the beastliness of human beings through the analysis of the action and psychology of apes, and reveal the secrets of human beings during their evolution, e.g. why apes smile? Do monkeys have culture? What is the connection between the action of apes and human beings? The exhibition organizer also prepared abundant learning resources and educational activities for visitors, e.g. serial pictures of primates on mobile phones, the Ape Legend special website, and science popularization lectures. Reservations for some programs had to be made in advance.